Charles Archer, known to his grandchildren as Pop, was every bit as temperamental as his son C. George Archer. He had a busy life, keeping up with his strong-minded wife Blossom with whom he held a treasured rivalry to produce the most bizarre things in the garden. Blossom specialised in what she called companion plants but Charles was more interested in vegetables. …Sheepface nicked a whole heap of the carrots Pop had grown to sell to Villajicacki Broggen’s restaurant/deli in Sol Street. Pop wasn’t very pleased, but Fluffbugs was. Fluffbugs was delighted. The carrots Fluffbugs enjoyed were more-or-less normal specimens of Daucus carota sativus, but the catering carrot was something else. ‘Who’d want to lay a finger on it?’ said Sheepface, and for once I agreed. Pop’s catering carrot was a real whopper. 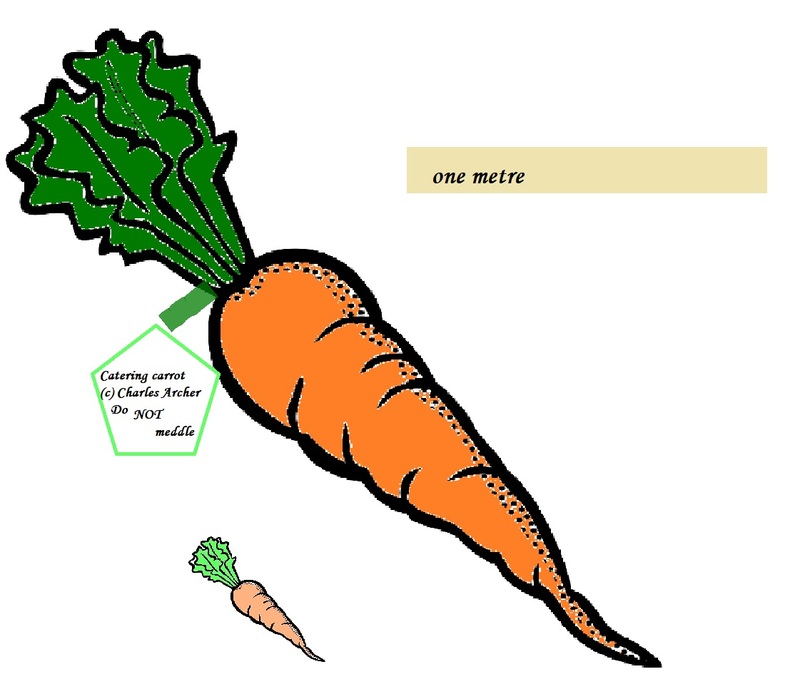 It was over a metre long, and Pop had bred it especially so’s restaurant keepers like Villajicacki Broggen would be able to buy five carrots instead of five hundred. Rachel opined that not even Fluffbugs could eat a whole catering carrot, but her dad didn’t agree, calling Fluffbugs a one-rabbit vegetable processor. Harrington naturally returned with the famous catering carrot which was soon reduced to a stub. Charles raged for a bit and then bred a bigger one. Fluffbugs Fang dived back down the hole to emerge only when golfers were foolish enough to include carrot in their lunch-packs. So that was all right!